With tomorrow (April 27) as the final entry deadline for The 2011 American Business Awards (you'll find the entry kit online), we thought we'd inspire those of you working feverishly to prepare your entries with a tale of one of last year's Stevie Award winners, to show you that your hard work can pay off. Nutricap Labs of Farmingdale, New York, received a Stevie Award for Best Overall Company of the Year-Up to 100 Employees in the 2010 ABAs. Here we profile the company and its founder, Jason Provenzano. Jason Provenzano, president and founder of Nutricap Labs, founded the company in 2003. Yet despite the lagging economy, this startup company has achieved revenue growth in excess of 2,900% since 2005, with annual sales reaching $16.2M in 2010. In accepting the Stevie Award last June, Provenzano said: "This award represents all of the hard work that I and my team have put into our company over the last eight years. I truly believe that we have the best company and the best people at Nutricap Labs, and this award is proof of that." portal, and an in-house packaging team will pack and ship the product directly to their customers. This full-service manufacturing solution not only provides clients with the assurance that their orders are being handled by a reliable, professional team of experts, but also allows them time to focus on marketing and building their own businesses. Nutricap Labs guarantees that quote requests submitted by customers are turned around in 24 to 48 hours, and products are delivered in as little as two to three weeks. Product advisors work with clients from beginning to end to ensure that the product the client receives meets their exact specifications. Nutricap Labs has a team of in-house designers that can assist customers with their graphic design needs. From logo creation to the design and printing of direct mail post cards and product inserts, this team will go the extra mile to make sure that the customers’ products stand out in the marketplace. Provenzano is dedicated to educating his peers so they can benefit from his fifteen years of experience in the nutraceutical manufacturing industry. As a member of Vistage, Provenzano meets monthly with other local business owners so that, as a collective, they can solve problems, become better leaders, make better decisions, and achieve better results. Additionally, in May 2010, Provenzano conducted a webinar designed to educate owners of dietary supplement product lines on the importance of GMP certification that was attended by more than 1,200 people. Nutricap Labs is a proud sponsor of Vitamin Angels, a not-for-profit organization whose mission is to mobilize and deploy private-sector resources to advance availability, access, and use of micronutrients to newborns, infants, and children in need. Over the past three years, Nutricap Labs has partnered with the American Red Cross of Greater New York to provide food, water, and medical supplies to earthquake victims in Haiti and–most recently–to those affected by the earthquake and tsunami in Japan. As a result of fundraising activities such as casual dress days, bake sales, and cooking competitions, the employees of Nutricap Labs have raised over $1,000 for the people of Japan. Recently, Jason Provenzano announced that at the end of April he would personally match the total amount of money that his team raised. In the spring of 2009, Nutricap Labs partnered with the Suffolk County, New York Chapter of Make-A-Wish Foundation to grant the wish of a local child. Nutricap Labs is a proud sponsor of Anna House, a 7,500-square-foot child-care center inside New York's Belmont Park. The BCCA is a not-for-profit corporation dedicated to creating and sustaining a child-care center for the benefit of families working in New York's racing industry. order fulfillment services under one roof. Despite facing stiff competition, Nutricap Labs has built a stellar reputation for itself by providing clients with fast-quote turnaround times and GMP-certified products such as tablets, capsules, softgels, and powders. Provenzano is a proud member of Vistage and currently resides in Massapequa, New York, with his wife and four children. Nutricap Labs is a leading provider of in-house nutraceutical services such as manufacturing, labeling and packaging design, and fulfillment. Founded in 2003 by Jason Provenzano, Nutricap Labs is a two-time Inc. Magazine Inc. 500 honoree and was named the 42nd fastest-growing company in America in 2009. Additionally, Nutricap Labs has partnered with several local and nationally recognized charities such as the Make-a-Wish Foundation, Vitamin Angels, and The American Red Cross in Greater New York. Want to win a Stevie Award in The American Business Awards as Nutricap Labs did? You won't if you don't enter. You'll find the 2011 entry kit here. Need more time to submit your entries? Request a short deadline extension. Would You Like to Judge This Year's American Business Awards? 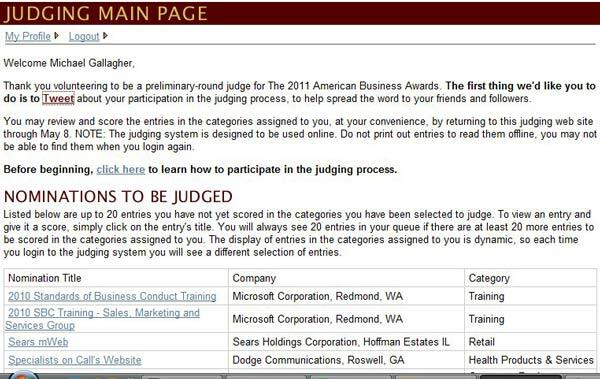 Preliminary judging is now open for The 2011 American Business Awards, and you're invited to participate. See the introduction and application page on the ABA web site. If you're a working professional with experience in your discipline, you'll be assigned categories related to your expertise. The ABAs have many different categories: PR awards, marketing awards, HR awards, customer service awards, web awards, management awards, and more. Preliminary judging will continue through May 8. This important stage of judging determines the Finalists, which each year represents the top 30-40% of all entries submitted. The judging system is designed to be used online, and you can do as much judging as you'd like, day or night, in the categories assigned to you. Even if you've already entered or plan to enter the ABAs this year, you can still participate in the judging process, because you can still judge categories in which your organization is not an entrant. As a judge you learn how other organizations are achieving great things, and you'll have another significant accomplishment to add to your own resume. You'll be recognized on the ABA web site and in the awards dinner program. And if you're one of the two preliminary judges who score the most entries, you'll be offered two tickets to the June 20 award banquet in New York. The Stevie® Awards today named the ten executives who will chair and form specialized final judging committees for its Ninth Annual American Business Awards. All organizations operating in the U.S.A. - public and private, large and small, for-profit and non-profit - are eligible to submit nominations to The American Business Awards. April 27 is the final entry deadline this year. Details are available at http://www.stevieawards.com/aba/. Finalists in the 2011 American Business Awards will be determined in preliminary judging to be conducted in April and May by volunteer professionals nationwide. Final judging, to be conducted by panels to be formed by the newly appointed committee chairs, will take place from late May through early June. In total more than 150 executives will participate in this year’s judging process. The 2011 awards will be announced on June 20 at the Marriott Marquis Hotel in New York City and will honor achievements since the beginning of 2010. 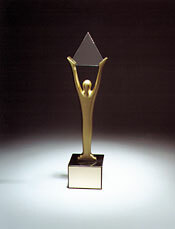 To enter The 2011 American Business Awards, visit: http://www.stevieawards.com/aba. Stevie Awards are conferred in four programs: The American Business Awards, The International Business Awards, the Stevie Awards for Women in Business, and the Stevie Awards for Sales & Customer Service. Honoring organizations of all types and sizes and the people behind them, the Stevies recognize outstanding performances in the workplace worldwide. Learn more about the Stevie Awards at http://www.stevieawards.com, and follow the Stevie Awards on Twitter @TheStevieAwards.